I came home from school today and was having dinner. My father went to the Thiruchendur Murugan Temple during the day (as he was on vacation) and so asked me if I wanted some prasadam. 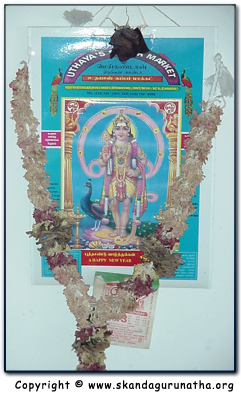 The prasadam was hot rice (puli-chaatham) and I replied, "See, Murugan knows the food I like. [I am fond of spicy food, but cannot eat too much because of my chronic heartburn problem]." I added,"Did you know that during the Kanthar Sashti fast, He gave me such nice, hot, and spicy food? And I never once had heart burn! The food that He gave me was the best and cannot be found anywhere else, especially one that is spicy and does not give me heartburn." As soon as I said this, the big rose on top of the Murugan picture beside our dining table flew and landed beside my plate. I was shocked and watched in sheer amazement! "Wow! Bhagavan Sri Skanda is always listening and watching over us!" is all I can say! BTW, thanks Muruga for the spicy food prasadam. It was delicious!